Yesterday, Michigan's favorite homophobe, Andrew Shirvell, was finally fired. What took them so long? The official statement from Attorney General Mike Cox, who had declined to do much about Shirvell's bizarre campaign against University of Michigan student body president Chris Armstrong, indicated that Shirvell was fired because he used state resources, and because he lied to investigators. It may have been the latter that finally tipped the balance, since Cox had used a free speech justification for keeping Shirvell on. "To be clear, I refuse to fire anyone for exercising their First Amendment rights, regardless of how popular or unpopular their positions might be," Cox said in the statement. "However, Mr. Shirvell repeatedly violated office policies, engaged in borderline stalking behavior, and inappropriately used state resources, our investigation showed." Borderline? 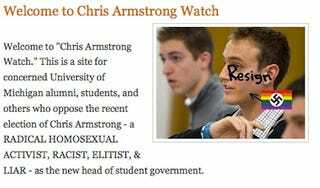 Shirvell showed up to events where he knew Armstrong would be, obsessively blogged about his activities, his friends' activities, and his friends' parents activities. He came to Armstrong's house three times, including once at 1:30am. All activities Shirvell can unfortunately now return to full time — but fortunately, not while on the government payroll. The next step: Armstrong and his lawyer moving to have Shirvell disbarred. Shirvell's lawyer, of course, said he thinks his client is "a victim of the liberal media piling on." That, or his own bigotry.